The last Wednesday of March rolled around and a good turnout of 115 players arrived for the 3rd PAGS Tournament of 2014 at Crystal Bay, with the B & C combination the chosen layout. The course was the hot topic of conversation (moreover the greens), after the round. For many years Crystal Bay’s greens were amongst the elite in the area but they currently pale in comparison to those days gone by. Still, the course generally was in good condition, with some recent reported wet areas from sprinkler leakages being remedied. The undoubted star of the day was Barry Copestake with a Hole in One on the tricky B6. This hole always presents problems when putting, so Barry decided to short circuit that, holing out from 119 yards with a wedge. Barry generously shouted a drink in for all Shenanigans attendees at the conclusion of the prize presentation, courtesy of his prize sponsored by Dez Chalice from Door 2 Door. Door 2 Door’s Dez Chalice congratulates Barry Copestake on his hole in one. Paul McNally (H/cap 3) was the standout golfer as he continued his fine PAGS form with the day’s best low gross score of 72 and second place in the net competition. He also picked up a couple of technical prizes for good measure. The opportunity for technical prizes is an attraction of the PAGS tournaments, with prizes on each hole and several holes offering 2 & 3 prizes across flights, genders & age groups. Jeff Wylie (8) was this month’s A flight winner with a day’s high of 42 points, ahead of Paul McNally with 39, and Kenneth Soder (8) took third after being edged on a count back on the last 3 holes by Paul while Shaun Merriman on the same score was eliminated at the last 6 hole cut. B flight (13–18) saw Richard Shutt (H/cap 18) lead the way home with 38 points ahead of JP McCaffery (13) on 37. It was a count back which decided third place after 4 players signed for 36 points, Cavin (18) claiming the prize with a clear 19 on the back 9. The C flight (19–28) required count backs also for second and third spots after Donald NcGuinnen (24) was the clear winner with 39 points. Terry Hutchinson (19) with 20 on the back 9 got the nod for second over marker Heiki Kivinemi (25) who signed for a back 9 of 19, while Ronny Walfridson was the unlucky player with 18. Jeff Cordiero tees off at Crystal Bay. The Ladies flight was clear cut with only a small contingent turning out this month. The winner was Yui Bietry (15) scoring a solid 38 points. 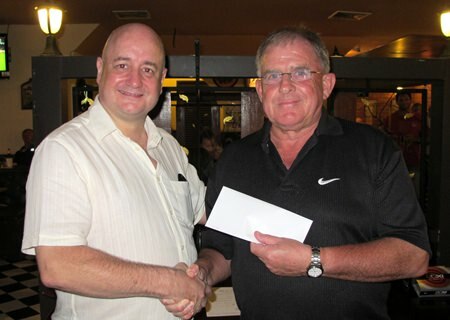 The social side of the PAGS tournaments, the prize presentation at Shenanigans Jomtien, continued its high standard as golfers, family & friends got together to support all the prize winners of the day while enjoying the abundance of tucker served up by Dave & his crew. 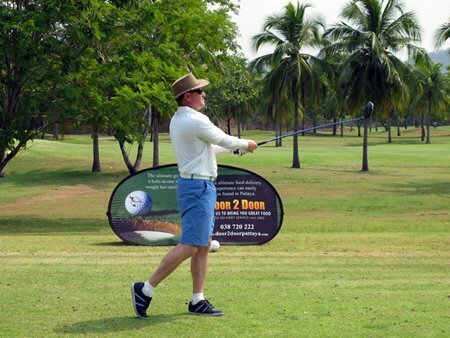 This month’s tournament will be held at Greenwood on 30th April at a cost of 1,600 baht inclusive of green & caddy fee, competition & BBQ at Shenanigans Jomtien. It will again be popular so early registration with Shane on 085 945 9689 is recommended.